Members of the U.S. Olympic gymnastics team, including the gold-medal winning Fierce Five, stopped by the White House this week. They met President Barack Obama and toured the house. 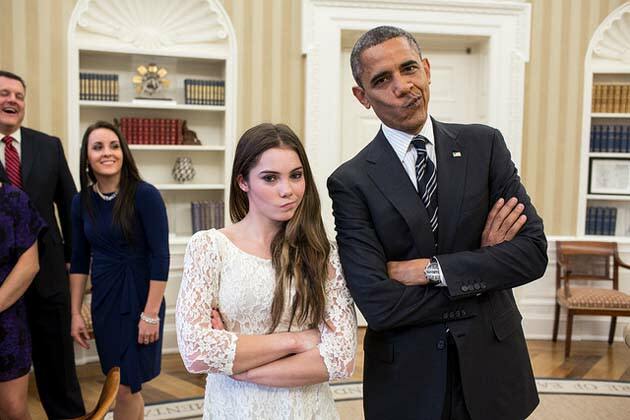 At the time of the visit, McKayla Maroney tweeted, "Did I just do the not impressed face with the President?" The answer is yes. Yes, she sure did. Maroney first showed her not impressed face after winning the silver medal at the London Olympics. During the vault final, she fell and didn't win the gold she was expected to. While on the medal stand, her face showed her emotion -- not impressed. The face became a viral joke on the internet, and Maroney showed a good sense of humor about it. It culminated with her doing the not impressed face with the most powerful man in the world. • Is NASCAR a sport or is it entertainment?